Wait until your flea treatment dries before bathing your pup. One lady flea can lay up to 50 eggs a day, so treating a flea problem right away is critical to getting your home under control. Bathing will wash off fleas, but if given too soon it can compromise the effectiveness of treatment. Be patient; you won't wait too long. For topical flea treatments applied directly to a dog's skin, such as liquid treatments that soak into his skin, wait until the treatment has dried. Product manufacturers generally advise 48 hours. Bathing Fido sooner than this would remove the product from his skin and could compromise its effectiveness. Rest assured that the flea treatment is working and wait it out. Since flea collars are typically waterproof, you don't need to remove them when bathing your pooch. This means that you can pop Fido in the tub for a wash while he's wearing the flea collar without waiting at all. 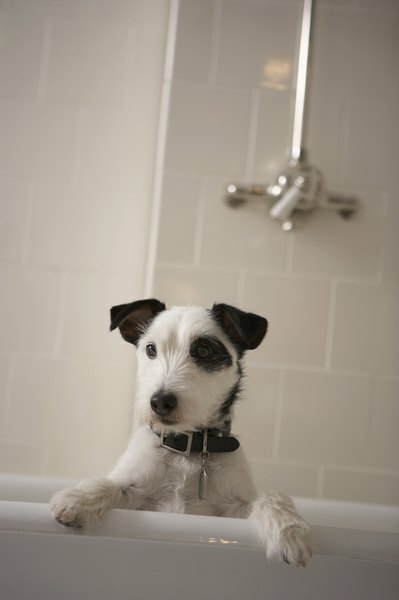 Since it may be easier to bathe Fido when he's not wearing the collar, you may decide to remove it for bath time and put it back on when Fido's dry. Either choice is perfectly fine. Always use a shampoo specifically designed for dogs when bathing your pooch. Human shampoos are harsher and can strip oils from Fido's skin. If you know your dog has fleas and you want to give him a bath without waiting, just bathe Fido first. Once his coat dries, apply your flea treatment. When your pooch has fleas, it may be easy to think that if one flea control product is good, two will really speed up the cleanup. Not so! Applying multiple flea control products at one time gives Fido a mega-dose of chemicals. Be gentle to your dog and use only one flea control product at a time. If you use a flea collar or topical treatments, there's no need to apply flea powder, for example.